After 11 years and an iterative, collaborative process, AHMM’s repurposing of the University of Amsterdam’s Roeterseiland Campus, on the southeast edge of the city centre, is complete. The project has transformed two science laboratory buildings from the Sixties into a renewed, bright, coherent campus that better serves the needs of staff and students of the law and social sciences faculties that have moved in. AHMM’s strategy, focused on connectivity, started with the campus’ relationship to one of the most iconic aspects of Amsterdam: its canals. And this has been the most striking intervention from AHMM: the practice removed four floors from the 40m-long part of the building spanning the canal, immediately opening up vistas along the water, as well as encouraging pedestrian movement underneath. A fully glazed, double-height space was inserted in the gap, hanging from a box girder. This has become the university’s ‘living room’, a multipurpose leisure space boasting views across the city. This intervention was just one part of a larger process of ‘rethinking and reorganising’ Gawronski’s masterplan for the campus, which never fully came to fruition and resulted in a ‘confusing site to navigate’, says Romanis. As well as the slab block, confusingly called Building BC by the university, there is Building A: a square-plan, eight-storey tower set on a three-storey podium. AHMM replaced the existing facades of both buildings with sleek, black cladding, enhanced by anodised bronze window trim. But crucially, the practice rethought movement across the whole site. A new pedestrian bridge was created connecting both sides of the campus — a rare occurrence in the strictly regulated historic city centre. 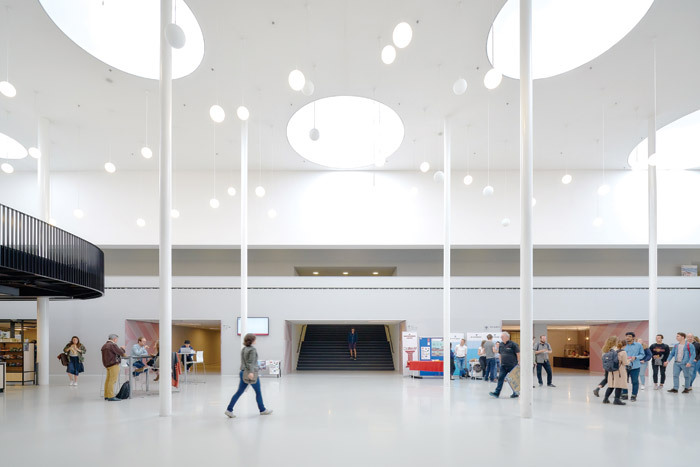 Between buildings A and BC, at ground level, a new elegant, triple-height entrance hallway was designed — featuring slender white columns, a sea of spherical hanging lights and large circular Barrisol rooflights — forming the nucleus of the site, enabling access to all facilities through one, bright, coherent space. Throughout the campus, walls have been knocked down, structural elements exposed, floors punctuated and staircases widened to create more fluid, open spaces to enable the easy movement of thousands of users. In Building BC, cramped corridors have transformed into spacious walkways punctuated by ‘mini atria’, opening up connections with other floors. In Building A, a new full-height atrium results in a soaring space, decorated with a seven-storey artwork by Barbara Broekman. Navigation has also been enhanced by creative strategies inside and out. Internally, the graphic wayfinding programme, developed by Hat-Trick, centres on the motif of diagonal stripes, manifesting in signage and murals to nudge people in the right directions. AHMM also introduced a bold colour-coding scheme across Building BC, demarcating each department with a pervasive hue (yellow, cornflower blue, and an unfortunate sickly lime green). Outside, a sense of coherence and journey has been created by Blaisse’s public-realm strategy, centred on the notion of a meandering ribbon. The newly laid vernacular red-brick paving is animated by a pattern of white bricks, creating a dancing, playful line on the ground. Its stripy nature echoes the wayfinding graphics, and the ‘ribbon’ encourages movement around the site. ‘It fluidly invites you in [to the site],’ says Blaisse. ‘It swirls, creating places and moments. It ignores boundaries.’ At points, the ribbon motif continues through the seating and planting, which takes on its form. Blaisse’s team also created canalside, stone, theatre-like seating and a series of public benches — including those that line the pedestrian bridge (which Blaisse calls the ‘flirting bridge’ for its sociability). The interior ‘study landscapes’, as they’ve been termed, are surprisingly attractive too. The first-floor library in Building A’s podium volume — now home to lecture halls, tutorial rooms and classrooms — offers an array of beautifully designed furniture and lighting configurations for studying, created by PUUR Interieurarchitecten. Elsewhere across the campus, study spaces are diverse, flexible and comfortable, as if the university has become a trendy co-working hub. The new lecture halls, meanwhile, are certainly better than their claustrophobic, vertiginous predecessors, but do feel clinical in a way the communal ‘study landscapes’ avoid.